JessTrev muses about one of the APLS questions of the month: Have you found ways to share a connection to nature with your loved ones, young and old? When I think about my relationship with nature, it's hard not to think about my father. He's been an avid birdwatcher for the past sixty years, and his naturalist tendencies were 100% responsible for me winning the Golden Guide to Cacti at science camp in the 3rd grade (they tossed up a softball mystery item for us to identify: coral mushrooms, which my dad liked to gather and then saute in butter for us after a nice woods walk). Lest you think I grew up in some grand expanse of wilderness, let me disabuse you of that notion: 100% suburban upbringing. But my dad, because he liked to be outside with his binoculars, and because he loved our dogs so much, made sure our house was within walking distance of the woods. Not just green space, but woods. Interesting, because, although it's a lucky break that we have decent schools (yay, kids!) we (my husband and I) really moved to our place so that our dog, may he rest in peace, could romp through Rock Creek Park. going backcounty camping as an adult. My father played a big role in introducing a respect for the natural world to me; I wish I could say I inherited his eye for detail. Luckily, my sister-in-law's a master organic gardener with an encyclopedic grasp of flora so my kids will get to experience some of her wonder on family trips. Me? I'm more of a creative writer type than a scientist, so I can't tell you the names of all that I see (and I don't think I'm as attuned with my surroundings as my dad and SIL -- I think I literally see less). But I love and want to preserve the natural world in large part because those I love have shared with me what they see on our dogwalks and family hikes (gotta love those grandpas). I'd like to say here to boot that somehow prior generations seem to have romanticized nature less than we do nowadays with our fuzzy polar bear cubs. My dad was a big Alpha-Wolf-talkin', nature-is-ferocious kinda guy. And he was pretty interested in taxidermy as a kid, enough so that my sweet grandmother used to save dead birds in her freezer for the neighborhood kids long after that childhood hobby went out of vogue! As I raise my children in a city, the element I think about the most is having access to (an unromanticized) space in which animals (including my kids) can run free. Not the fact that they're in a walkable, dense, little urban community. I love that! We can skip on down to our own woods to feel a little closer to those trees and birds. What I don't want them to miss out on is the ability to run free (or study cicadas) for hours on end. A love of nature that will lead to environmentalism? I think that will come simply from my daughter's boundless empathy and her genuine interest in critters (and her little bro's too young to peg). If not from empathy, though, it might come from that expansiveness that comes from a visceral reaction to wilderness -- and wanting to protect that experience. That feeling of freedom, of peace within nature? May have to come when they are adults, perhaps following in my brother's and my footsteps and taking a 3 month backcountry trip with each other! I know if I lived in a more rural area, my kids could have this freedom routinely. When I think about my friends who live in Vermont, it's not the rolling meadows or the pond with a canoe or even the cross country trails out their back door that make me daydream about packing up my house. It's the thought (that others have voiced) that kids should be able to putter and daydream for hours on end all by themselves, without being monitored. As their childhood experiences shape them, I hope that a sense of independence from needing to be entertained can come for my kids even if my eyes are ever-present. Somehow, I think that, in my psyche, being able to be alone in the woods may be a prerequisite for happiness and self-sufficiency, and certainly for self-directed learning. Gotta get those kids on some camping trips! P.S. My dad's kept detailed notes of all the wildlife he's seen since he was a kid. When I lived in California, it was fascinating to go to Tilden Park in Berkeley with him 'cause he could compare his wildlife trackings from the early sixties (when he was in grad school there) to what he saw in the beginning of this century. Suffice it to say that when he sees a new bird, it's pretty huge. So the picture at the top? 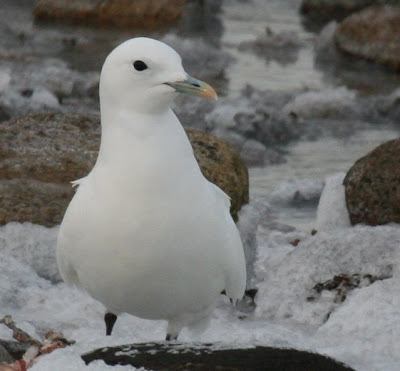 Is what he would call a Life Bird: an Ivory Gull (he emailed the photo tomy daughter). As he says of these sightings: "These are spiritual moments for me." I think that pretty much sums up his legacy. As I've been reading all the posts people are putting up for the APLS Carnival, I'm struck by a common theme: unstructured time for children. A simple fenced-in suburban yard works as well as living in a wilderness for this, although a nearby woods (or in my case, open grassland) sure could enhance the experience. So, maybe what we really need for our kids is to turn off the tv, stop siging them up for umpteen activities, and try to make sure there's grown-up around in the background after school so they can just go out and play by the hour. Mine were raised without tv when they were little, and even after we got one, it was not to go on until after supper. They entertained themselves pretty well with whatever was at hand for many hours at a time. Oh yes, get the kids on some camping trips. We have one fabulous one that we go on every year. A group of usually about six-eight families goes together. We often do a service project together (usually picking up trash or fixing trails), which helps give the kids a better respect for their impact on nature. There are lots of kids to run around with, trails, ponds, and rocks to climb on. My kids are now off in college, but they still come on this trip every year. Joyce - I agree - unstructured time is fantastic. Mine have it every day after school until dinner - outside every day barring bad weather - but somehow I'd love for them to have some unstructured time without a grownup in the background! Not possible in the city.... But yes, 'hang time' is much defended in our house too! Daphne - I love the sounds of your camping trips! Multiple families *and* the cleanup projects. Definitely want to head down that path. Thanks for sharing! One of my favorite things to do is to take a hike with an expert of any particular terrain. Not a professional, but just someone who takes an interest like your Father in the area California you referenced. I love nature. I take my young child on bike rides, and talk about what I see to her. She really seems to enjoy it. I hear you on this one. Obviously, given my earlier post on the same subject. I do think camping trips and similar outings help for those of us in more urban settings. Great job puting together the carnival! 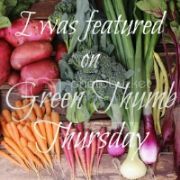 This was my first, and I love being a part of such phenomenal group of green moms. It is amazing to me that so many different women living in so many different places seem to be reading each other's minds. I'm go to go fill up my coffee now and start reading!! I popped back to say that, in talking with my kids, they mentioned that just having to walk to and from school each day, and delivering papers when they were older, gave them some experience with the out of doors that some of their friends missed. They learned to dress for the weather, splashed through puddles, threw snowballs, found "favorite" sticks and rocks, and observed the changes in the flowers and trees seasonally, all within a couple of blocks of home. So, again, not a wilderness, but a daily experience that too many kids are missing by getting rides to school these days. "so that our dog, may he rest in peace"
Joyce - glad to hear that your kids look back fondly on their walks to school. My kid walks to/from school each day and the block-long walk takes, er, a lot longer than 3 or 4 minutes. Agreed on the daily experience being worthwhile - it's one of my favorite things about our neighborhood. There's something pretty magical about the swarms of kids and parents all ambling along in the morning (and then getting to 'splore on the way home). As I read your post, I kept thinking about Stephen Covey and other time management gurus all saying that where people spend their time shows what is most important to them. A corollary seems to be where we allow our kids to have time. BTW, your grandma sounds awesome. How sweet of her to donate freezer space to expired birds for the neighborhood kids!